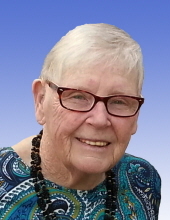 Eileen Lillian (Macken) Mengis passed away on Monday January 7th at The Bird House (Hospice Home) of Johnson County Iowa. She was 90 years old. Per her wishes a celebration of life and scattering of cremains in Minnesota will be scheduled at a later date. Eileen was born on January 2nd 1929 in Rochester Minnesota where she lived until moving to Iowa City in 1968. She was the daughter of James Joseph Macken and Mary Lillian (Griffin) Macken. Eileen was dearly loved for her Irish sense of humor, quick wit and storytelling. She was able to find the joy in everyday life and see the silver lining in any situation. She enjoyed volunteering throughout her life with a special interest in children’s reading programs and helping children with special needs. Eileen was a nature lover and an avid and accomplished gardener that enjoyed giving tours of her numerous perennial beds. her children, Mary (Michael) Kundert, Lou Ann ( Perry) Kraus, Linda (Geoff) Butterfield and Robert Mengis; her grandchildren, Katrina (Ryan) Harrison, Kathleen (Chris) Smith, and Logan Sears; and her great grandchildren, Parker and Addie Smith and Keira Harrison. Eileen was preceded in death by her brothers James, Francis, Dave, Robert and Ralph Macken. Iowa City Hospice, The Bird House (Hospice Home) and Elder Services Meals on Wheels. To send flowers or a remembrance gift to the family of Eileen L. Mengis, please visit our Tribute Store. "Email Address" would like to share the life celebration of Eileen L. Mengis. Click on the "link" to go to share a favorite memory or leave a condolence message for the family.